The First Trailer For Ben Affleck’s Live By Night Is Here!!! 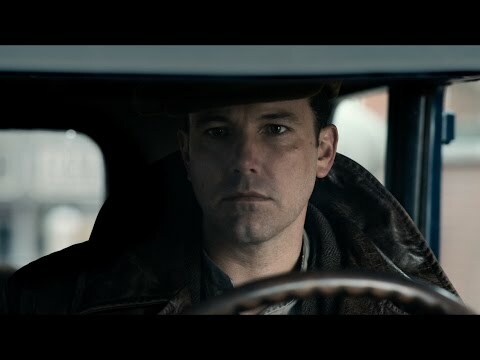 Before he donned the cowl once more for Zack Snyder’s Justice League, Ben Affleck took some time out from the DCEU to step behind the camera for the first time since 2012’s Argo, adapting Denis Lehane’s prohibition era novel Live by Night for the big screen. On top of writing and directing, Affleck takes the lead as Joe Coughlin, a small time bootlegger in Florida who works his way up to been a notorious gangster. The powerful first trailer for this long awaited follow-up to Argo is finally here, and boy, does it have tons of style, evoking fond memories of other period set crime dramas, especially Road to Perdition and The Untouchables, but still telling it’s own interesting tale of a conflicted villain. And Affleck has surrounded himself with a great cast, including Elle Fanning, Brendan Gleeson, Zoe Saldana, Sienna Miller, Chris Cooper, and Anthony Michael Hall. Unsurprisingly, Warner Bros. are pushing this for awards season, the movie receiving a limited release in December, and judging from this impressive first trailer, it could do very well in this year’s Oscar race. The Movie Bit: The First Trailer For Ben Affleck’s Live By Night Is Here!! !